Recipes for Dubbels seem to range from just pils malt and candi syrup to 10 different specialty grains. This is what I brewed on Sunday, and it leans more towards the simple, though it does include two crystal malts. I oxygenated and pitched at 62 degrees and let it free rise. It seems to have peaked around 72 and has been holding steady at that temp. since about 48 hours after pitching. I was hoping it was going to rise a bit higher but decided against bringing the temp up with the heater. I don't like it when my Belgians come out too clean, and I'm always trying to balance getting more flavors from the yeast against higher alcohols. Yep, looks good to me. I like the Special B and Dark Candi syrup in mine, too. Love the raisiny/dark fruit thing. I enjoy Tomme Arthur's version so much I keep going back to it, and want to brew it again soon! 1.00 oz. Fuggle Pellet 4.64 11.0 90 min. 0.50 oz. Liberty Pellet 4.38 4.7 60 min. 1.00 oz. Goldings - E.K. Pellet 5.30 3.1 15 min. wort with a splash of brandy (I did this), then puree. I need to brew his recipe sometime. I've started to a couple times and ended up brewing something else. It looks really solid. Last time I started to brew it I went with a Rochefort-type recipe ( ie., bigger). It just continues to improve as it ages, and I've overshot my OG and if anything that made it better. I share the opinion you previously posted, ya gotta use the Dark Candi Syrup (D2)! or D-180. I actually prefer the 180, but both are great products. Hi Denny. Although I admit that a variety of candi syrups would all work, I thought that d-180 and D2 are the same thing! By the way, I'll start carbonating a new batch of your BVIP tonight. However, after drinking some of the base beer left over and carbonated via Carbonator Cap, I actually wished that I had not added any vanilla or whisky. It is one winner of a straight imperial porter! I know I will enjoy it as BVIP too! Apologies for going off topic. They come from different companies with different processes, ingredients and flavors. I was afraid you'd say that. Well, I have 2 lbs of D2 in my fridge so I guess I'll be going with it this time. Thanks for the clarification. It's not that D2 is by ANY means a bad product! I just personally have a slight preference for the 180. Well, I'm pretty happy with how this came out. 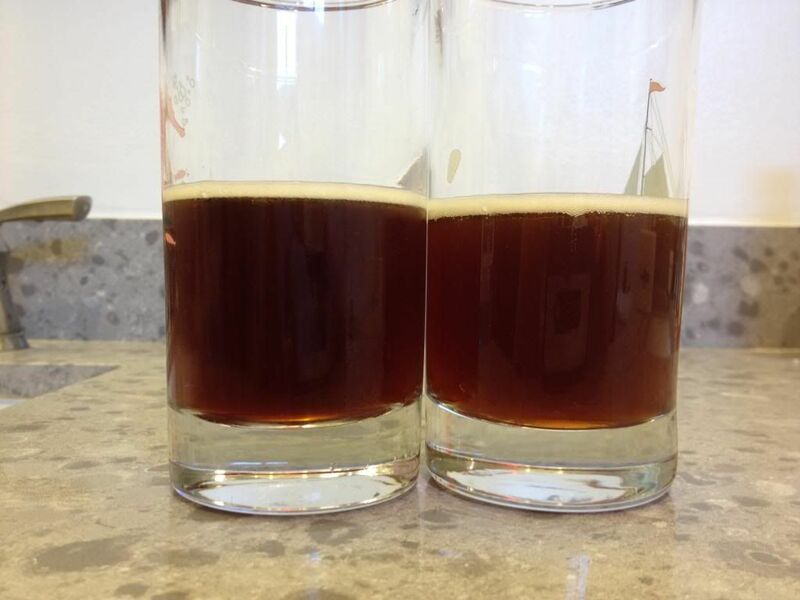 The lighting isn't great in this picture, but the color is pretty close to Westmalle (mine is on the left). Flavor-wise, the Westmalle has a richer dark fruit character, a hint more alcohol, and finishes with just a bit more of a sour twang. I'm not sure how I'm going to try to boost the dark fruit flavor on the next batch. More candi syrup (or maybe also a blend of the 90 and 180)? More special B? I think I'm going to enter it in an upcoming comp and see how it fares. I just realized that the Fuggle I posted in the above recipe is a sub for the Styrian Goldings called for. I'm getting together an order to brew it next week. Narcout - looks great! Good luck if you take it to comp.